Tensioner pulleys provide precise guidance and constant belt tension in the belt drive. They can either be mounted rigidly or combined with the tensioning elements to belt tensioners. Tensioner pulleys increase the wrap angle on belt drives and thereby transmit higher performance. They enable a change in the rotational direction of the connected aggregates. In combination with belt tensioners, they also compensate for operational belt stretching. Tensioner pulleys of the DT® Spare Parts brand consist primarily of ball bearings and belt tensioner. The ball bearings are filled with heat-resistant grease and perfectly sealed on both sides. Various materials are used in the production of belt tensioners, depending on the technical requirements, for example deep-drawn sheet steel, turned bar, cast steel or Polyamide 66 with glass fibre content. Tensioner pulleys of the DT® Spare Parts brand are designed for a maximum temperature of up to 120°C and 6 000 RPM. The precision-machined contact surfaces of the belt tensioner ensure optimal installation of the drive belt, low wear and minimal operating noise. The groove shape of the belt tensioner is adapted to the V-rib standard ISO 9982 / DIN 7867. The defined convex surface of the counter-pressure roller without ribbed V-profile keeps the belt in the centre position and so enables optimal guiding. The removal and installation of a new tensioner pulley should be carried out by skilled specialist staff. When replacing pulleys, it is recommended to replace the belt tensioner as well as the belt. In addition to tensioner pulleys, DT® Spare Parts also offers all other standard articles for the belt drive. 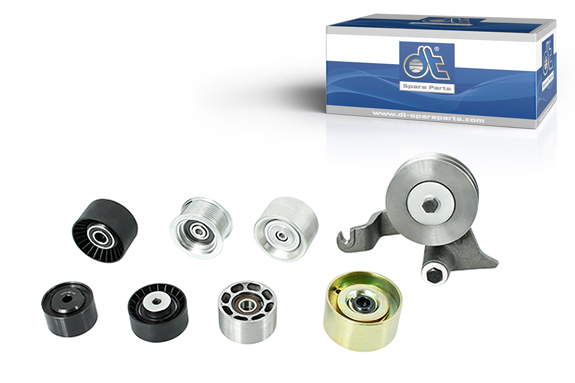 All spare parts required for replacement of tensioner pulleys are also available as complete repair kits.